The worrying thing about the prospect of writing a book is that there is a lot of words involved. I’ve never really thought about it but since this little venture started with Pie 12: The Rob Roy Pie I reckon I’ve probably managed over 75,000 words dedicated to pie whilst championing football’s cause across all levels, mainly junior but with more than a nod to the senior and ladies game. There’s even a couple of pies from across the globe…well England but you get my point. Along with all the peripheries that this journey has brought me that’s some achievement but it’s beginning to dawn on me that amalgamating all these tales of pastry themed whimsy is going to take all my accumulative nous not to end up with a soggy bottomed mess of pie all over the pages. The premise will be simple, it’ll be about pies and the journey of discovery that has taken me across the country whilst reflecting on some of the more bizarre things that have happened along the way. Will this be my pastry zenith? Only time will tell. As it stands though we need to reach that magic hundred and leading on from, Pie 88: The Spartans ‘Haggis & Neeps’ Pasty, there is another non-pie based pastry snack on the way from Rossvale. So without much further ado let’s rate some pie! I mean, bridie. You could almost kid yourself on this was Summer. Price: £1.50. The same price as the previously reviewed scotch pie offering from the same venue, more than the single golden nuggets I’ve had to part with in previous weeks but still nothing to be sniffed at. Presentation: It was one of those half and half paper and plastic bags which the bridie was wrapped into as tightly as possible. There was a small napkin dispenser at the counter but thanks to a bumper crowd there was but one dangling in the wind from it by the time I arrived twenty minutes in. When I started reviewing my pastries this kind of shortfall would annoy me but as I learned about the clubs and how they were run I understood the fine balance those at the very bottom of the game have to find between maximum profitability and the need to avoid a loss. Maybe ‘bigger’ clubs should be better at sharing knowledge in this respect rather than turning up and having a moan. Just a thought. Meatiness: The reason I prefer a pie to most other pastry snacks is that the ratios usually always work to the benefit of carnivores everywhere with the pastry acting as supporting cast to the meaty main event. In a bridie the balance isn’t quite the same, I’ll come onto the pastry in a bit but it’s important at this juncture to highlight that to get to this bridie’s core you had to chomp through layer upon layer of pastry. Once there you were greeted with a well seasoned and moist oniony mince parcel, it was just rather small. Pastry: As I have just highlighted there was an abundance of pastry to be had with this football snack. It was beautifully golden and flaked away well, it was consistent all the way round and had just a few layers of softer pastry underneath the initial crispness that eased you into a bite of meaty goodness further in. Due to a lack of pies, a number of my fellow fans had opted for a bridie and could be audibly heard singing the praises of this pastry surround. Brown Sauce: Much like a pasty to add sauce to a bridie is an invitation for an ever flowing waterfall of brown sauce flavoured goodness ending on the floor around you with no obvious pool for it to lie in. No sauce here. 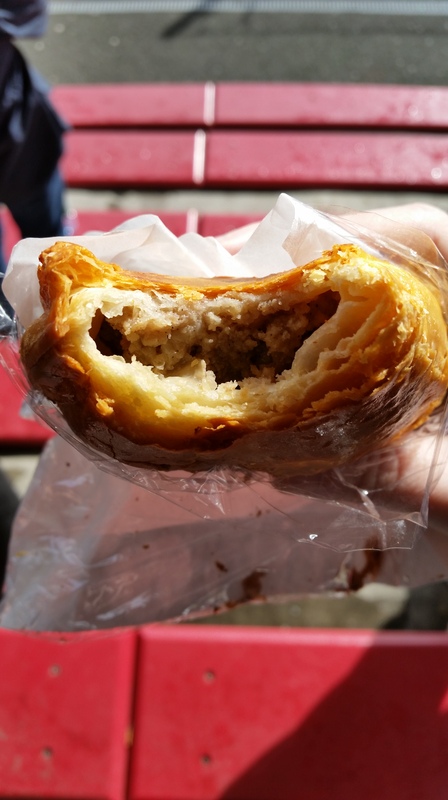 Overall: A tasty meat filled pastry, heavy on the pastry and perhaps a little light on the filling. Gravy Factor: Sometimes I like to get a hunk of bread and sook up all the gravy with it. There just wasn’t enough gravy here this time. Number 93 is in the books. Thanks to the wonders of modern-day Retail I currently have a Washing Machine scheduled to arrive at my flat sometime between 11-3 on a Saturday! I mean really!? Hopefully I can get that fixed and will be reviewing a luxury pie from Largs Thistle. However until, next time, go forth and eat pie! 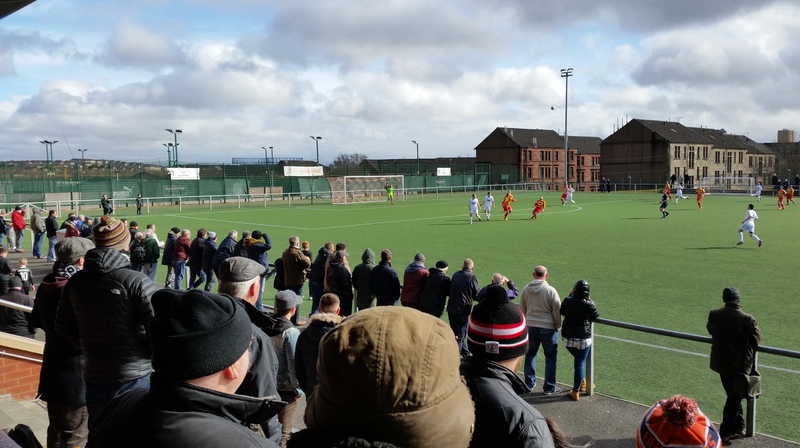 This entry was posted in Bridies, But That's Not a Pie!, Football Pies, Junior Pies, Sporting Pies, The Life of Pie and tagged bridie, central league cup, fitbaw, Football, Gravy, Juniors, largs thistle, Meat, meat filled pastries, pastry, Pie, pollok, rossvale.